Codependency - Moral Reconation Therapy - MRT® distributed exclusively by Correctional Counseling, Inc.Moral Reconation Therapy – MRT® distributed exclusively by Correctional Counseling, Inc. Codependency - Moral Reconation Therapy - MRT® distributed exclusively by Correctional Counseling, Inc.
Untangling Relationships is a program that targets co-dependency issues. It is appropriate for those with substance abuse disorders, mental health challenges, and/or basic relationship challenges. The material can be used in a variety of settings, including behavioral health providers, substance abuse treatment providers, hospitals, in-patient and outpatient services, criminal justice programs, church counseling, community health providers, and elsewhere. The workbook has 12 modules designed to be completed in 12 group sessions with a counselor or facilitator. Clients complete homework for each module prior to coming to the group session. During the group, clients present their homework to the group, and the facilitator passes the client to the next module — or has the client redo the homework, based on objective criteria. The groups are open-ended, meaning new clients can enter an ongoing group at any time. The workbook is individualized to each client’s needs in meetings with the facilitator or counselor to address specific issues. 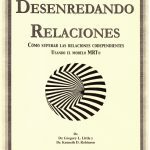 An Untangling Relationships Spanish workbook is available. MRT training is not required for the codependency workbook.